It is exactly 100 days until voters go to the polls in the London Mayor and Assembly elections. Ballot papers won't be crossed until May, but the contest to run one of the biggest cities in Europe is well under way. Groundhog day, Boris versus Ken II, a rematch - just some of the words used to describe an election where the two leading candidates are the same as four years ago. Will it be a straight re-run between the Conservative incumbent Boris Johnson and his Labour predecessor Ken Livingstone? Or will the race in 2012 offer Londoners something new? Though manifestos are still in draft form, sharp distinctions are already emerging between the Livingstone and Johnson campaigns. Nowhere is the division, so far, more apparent than on the subject of transport - the area where the Mayor of London has greatest power. Mr Livingstone has promised to cut fares by 7% in October, freeze prices in 2013 and limit futures hikes to inflation. Mr Johnson, meanwhile, thinks fares need to go in the opposite direction. He has defended his decision to increase the cost of this year's tickets by 5.6% as vital to maintain investment in London's transport infrastructure. The Labour candidate has said that no-one should pay more than a third of their wage on rent. Image caption Could Boris be kissing City Hall goodbye? His proposal for a London Living Rent has not yet been fleshed out, but Mr Livingstone suggests it would be modelled on the London Living Wage campaign. Mr Johnson argues that rent controls are counterproductive and would result in fewer homes being built. New ideas for London have also been announced by two other mayoral candidates. The Liberal Democrat hopeful Brian Paddick, former deputy assistant commissioner for the Metropolitan Police, wants to draw upon his experience to create neighbourhood patrols who would work with the police to tackle crime. And London Assembly Member Jenny Jones, the Green Party's candidate, promises that City Hall would only work with banks which lend to small businesses if she is elected. London is still waiting for Mr Johnson's team to disclose its key ideas for a second term. What we do know is that his campaign has been busy mobilising grassroots support and, up until now, prefers to highlight their candidate's role and record as mayor. Only last week we learned that the government will now consult on plans for an airport in the Thames estuary, an idea strongly backed by the mayor. We can expect plenty more proposals from him, and the other candidates, once the campaign period officially begins in March. So what have been the key achievements of the current and former mayor? Mr Johnson's team may point to freezing his portion of council tax for the past three years and delivery of the cycle hire scheme. Mr Livingstone, mayor of London from 2000 to 2008, might flag up his introduction of the congestion charge and an increase in the capital's bus services. We will be scrutinising the record of each candidate, in more detail, in the weeks to come. As we approach the fourth ballot ever held for mayor - the Greater London Authority was only created in 2000 - it is important not to forget that 25 seats on the London Assembly are also up for election. Currently made up of 11 Conservative, 8 Labour, three Lib Dem, two Green and one Independent, can we expect a change in the assembly's composition? At a time when new powers are being devolved to City Hall - from April, the mayor will control London's housing and economic development budget and looks set to gain greater powers over public health - the role of the assembly in holding the mayor to account is more important than ever. The significance of the mayoral election may also extend beyond the capital's boundaries. Indeed it's being viewed by some as a test for national politics as it sits nearly halfway through the coalition government's term. Will the result be as much a verdict on David Cameron, Ed Miliband and their respective parties as the personalities and policies of the candidates? Mr Livingstone is certainly capitalising on an anti-cuts agenda to connect with the "ordinary Londoner". But his team knows it needs to reach out to outer London as well as core voters to avoid him, like last time, being portrayed as a Zone One mayor. Mr Johnson's success in appealing to the suburbs and scoring a record number of votes in outer London boroughs such as Bromley - what was labelled the donut strategy - is seen as an important factor in his 2008 victory. In this last week opinion polls from YouGov and ComRes suggest that Mr Livingstone has moved ahead of Mr Johnson. In June, Mr Johnson was 8% ahead of his rival, according to YouGov. While the political landscape and the issues which matter most to Londoners may have changed, these latest surveys only suggest what the last election confirmed - it is going to be another close contest for City Hall. 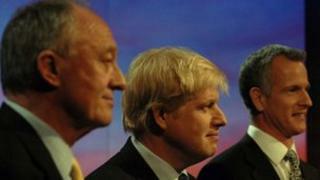 The London Mayor and Assembly elections will be held on Thursday, 3 May 2012. In order to vote you must be registered before Wednesday, 18 April.